What book sizes do you have and how much are they? We have 5×5-inch and an 8×8-inch books which are available in 60, 80 or 100 pages. The 5x5s cost P650, P800 and P1000 and the 8x8s cost P1300, P1700 and P2100. Do you have hard bound books? Sorry, we only have soft bound ones. 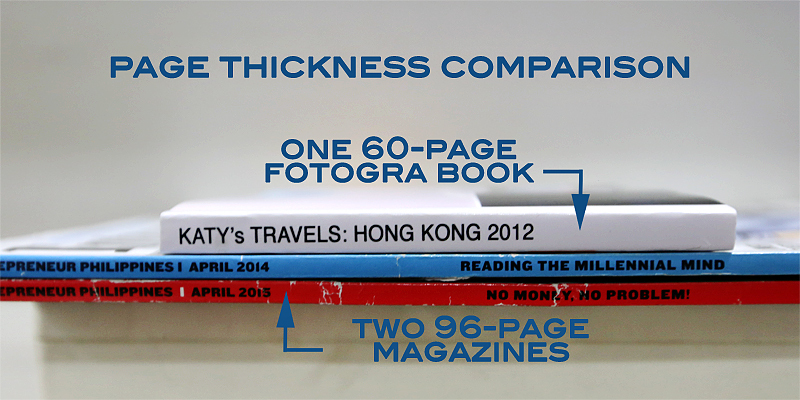 But our book pages are twice as thick and harder than the pages used in hard bound books or magazines. We are based in Quezon City, Philippines. We do everything online though, so no need to go to our office to order a book. We try reply within 1-2 days, unless we’re on holiday. Sorry, Viber or SMS contact number not available. Only for copies of the same book. Minimum order of 10 copies. How to order a book? We accept BPI deposit/fund transfer, GCash, PayPal and credit card (via PayPal). Is there a deadline for submission of photos? Yes, please submit photos within a year of purchasing your book. If you could send your photos within a month that would be awesome. Wouldn’t you like to enjoy your Fotogra Book right away? What image format and size do you accept? We accept JPG or PNG files only. For good quality prints, please submit photos that have at least a 600 pixels by 600 pixels at 72 dpi resolution for the 5×5 books and at least 1200 pixels by 1200 pixels at 72 dpi resolution for the 8×8 books. Of course, submission of higher resolution photos are encouraged. How many photos can I send? We print 1 image per page. So for a 60-page book, you may send 60 images plus 1 for the cover. An image can be just a single photo or a collage. If you wish to include more photos, either add more pages or do collages. If you have less than 60, as long as they’re at least 40 photos, we can still print them. It’ll cost the same as a 60-page book though. We have layout service if you want us to do the collage for you. It includes basic processing of the photos. You may send photos up to 3x the number of book pages. For more details, click here. You can send photos via your computer, tablet or phone. Just upload to a cloud sharing platform like Dropbox or Google Drive and send us the link or upload directly to our server. Either way, use our Submit Photos form to do so. 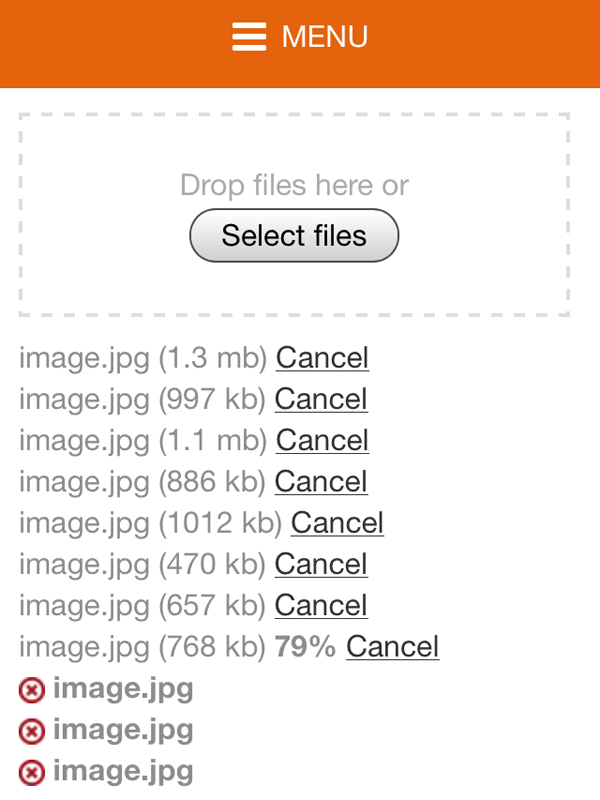 Below is a screenshot of how it should be when uploading files directly to our server via a computer. You have to wait until all files have been attached (you can see the progress bar beside each file). The X mark before the file means that it has already been attached to the form and can be unattached if you changed your mind (hence the X mark). After all files have been attached (all have X marks), you can then submit the form. 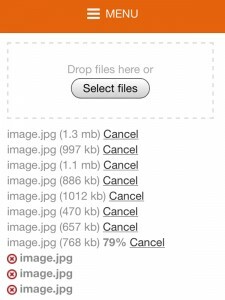 Our upload form unfortunately renames images sent from mobile devices as “image.jpg”. 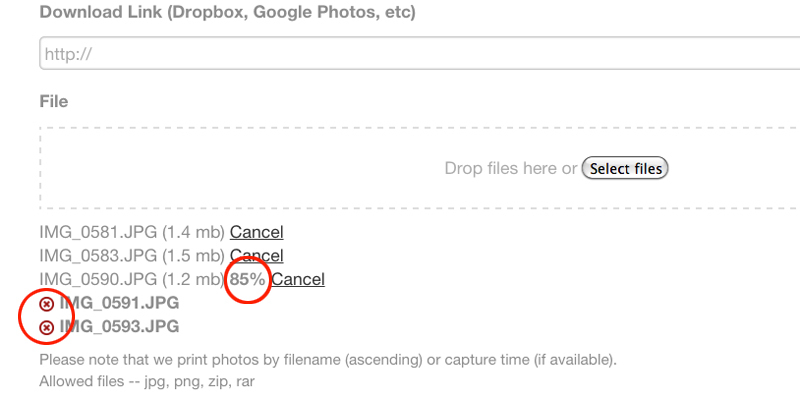 It may get kinda confusing to see 60+ image.jpg files being attached and not knowing which is which. 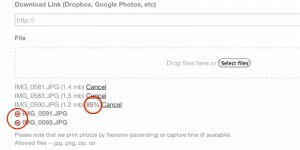 If you wish to have more control of the sequence, it would be best to transfer the images to a computer and rename the images first or just use Dropbox so you can rename the files in the app. How will I know if you got my photos? If you saw the “Thank You” message after submitting the Submit Photos form, then we got your photos. You will also get an email immediately upon form submission with the details of your submission. We will get in touch with you in case there is a problem with the files you sent. Sometimes, the email goes to the spam folder, so do check it there as well. Can I submit a Facebook album link instead? Yes you may but Facebook renames the photos you upload to your account, so if we print the photos from your album, they would be in random order. We use 220 GSM paper in matte finish for the inside pages and 260GSM photo paper in satin finish for the cover. Is the paper acid free? The supplier markets it as photo paper so we assume it is. But we cannot guarantee it is 100% acid free as some acidity is needed for the ink to be absorbed by the paper. An acid free mark doesn’t guarantee non-yellowing of paper; it is but just a marketing gimmick. Always best to keep your Fotogra Books in a cool and dry place (a cabinet or bookshelf) and away from direct sunlight (UV exposure). We use a 6-color dye ink printer which is specifically geared for photo printing. Print fading can mainly be due to exposure to UV rays (sunlight) and air pollutants. Based on a printer industry report, the inks we use resist fading fairly well and may reach around 30 years before it exhibits discernible fading when exposed to direct sunlight regularly. Since the images are in book form and not exposed, it will resist fading a lot longer. We always advice to keep your books in a cool and dry cabinet and away from direct sunlight. Pages with not much black ink resist water and won’t smudge easily. Pages with black ink may smudge when exposed to water. If your book accidentally gets wet, dabbing off the excess water with an absorbent cloth would be the best option. Keep your Fotogra Books cool, dry and out of direct light and they should last longer than the photographer. Will the prints match the photos in my monitor? Well they won’t match exactly; there would be slight shifts in color and brightness. Photos usually turn out a little darker on print than on screen. What do the pages look like? The inside pages have white borders on them. 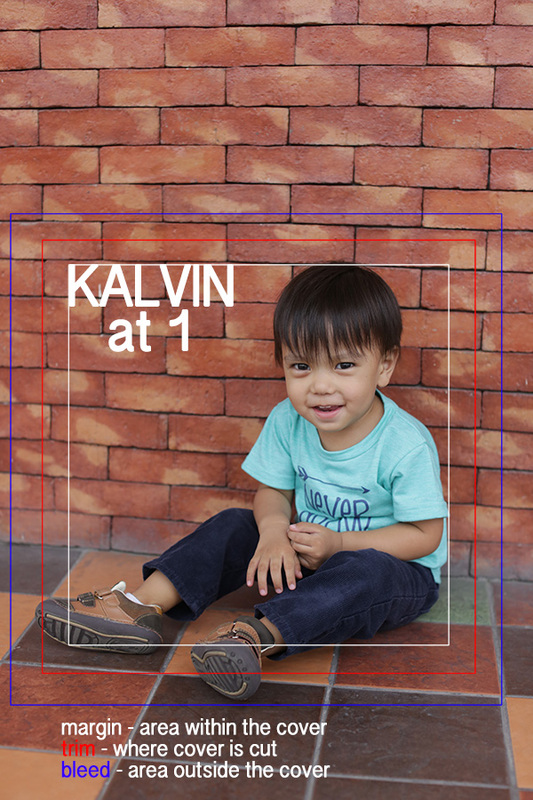 When submitting photos, please do not add borders on them as we will do that just before printing. No, we don’t. We print the photos as is. We just resize and sharpen them as preparation for printing. Can I do my own layout? Yes, of course. But you still have to send them per page and not per spread. Please take note also that we print our pages with borders all around so seamless spreads are not possible. 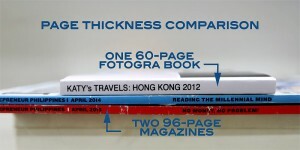 Can the pages be printed with no borders? Unfortunately, no. Only the covers can be printed full bleed. Should the photos be in square format? Only if you want to maximize the page space. We print photos as is, so rectangular photos are printed as such and not cropped to fit a square format. What's the order of the photos when printed? By default, we print the pages according to filename in ascending order or descending order for mobile uploads. We can also print according to date taken if that data is embedded in the photos. Where does page 1 start? Just like regular books, odd numbered pages are on the right side and even numbered pages on the left. So it’s page 1, followed by pages 2 and 3 (spread). Yes you can, but they have to be part of the image when submitted. Ex. photo on top, text at bottom, saved together as one image. What size should the cover photo be? If you’re particular about resolutions, send at least a 1500×1500 pixels at 300 dpi photo for a 5×5 book or 2400×2400 pixels at 300 dpi photo for an 8×8 book. When using a rectangular image as cover, make sure that when cropped to a square format, the important elements aren’t cropped out. Allot at least a 1/2 inch bleed space around your cover image. And best to keep important elements in the center of the image. See below a sample cover image. Cover images should have ample space beyond the red square, but the important elements should be within the white square. What do I put on the spine? You can leave it blank or put the book title on it. The space is limited to 35 characters, including spaces and special characters. We print titles as it was submitted so please make sure they’re written correctly before you submit the form. Can I put the title on the front cover too? If you wish to put the title on the front cover too, you have to submit an image with the title edited on it. Can I customize the back cover and the spine? Yes, the Custom Covers add-on is available for P50 for the 5×5 book or P250 for the 8×8 book. How long until I get my book? Book production takes 1 week (rush) or 3 weeks (non-rush), excluding holidays and shipping. Layout service adds 1 more week to book production. USB submissions also adds another week. Book ships out the next business day. Shipping may take 1-2 days for Metro Manila (expedited) or 3-5 days for Metro Manila (free) and provincial deliveries. Production starts after we receive both payment and files. Do you have rush service? Rush service is available for P300 (5×5) or P500 (8×8) per book for one week book production, holidays and shipping time not included. How do you ship the books? Free shipping for Metro Manila is via Blitz or Fastrack while expedited shipping and provincial is thru LBC, unless otherwise specified. We send a notification email once an order has been shipped with its tracking information. Sometimes the notification email goes in the Spam folder so be sure to check there too. If you have a Fotogra Books account, you can also login to check the status of your order. Can you ship to a different address? You can enter a different address from your billing address. Do this if you would like to send a Fotogra Book as a gift directly to the recipient. What if I entered a wrong shipping address? The package will be returned to us if the courier fails to deliver it to the recipient. We will reship the order to the correct address but you will have to shoulder the reshipping fee. Do you ship outside Metro Manila? Yes we do. Provincial shipping is P250 per order. Best to order a few books together (up to 10 books) to save on shipping costs. For international shipping, we send the books via post. It usually takes about 4-5 weeks. Shipping fee depends on total weight of package so it can be somewhere between P350 to P450 per book. What do you do with the photos after printing? We delete them from our system when your book gets delivered. What if I'm unhappy with my book? We make sure that you receive your order in the best condition possible. We do check the orders before we send them to production for print layout concerns but we do not check for misspellings, image quality or color. We assume that the files you have submitted are of the ideal photo resolution and color and the book titles are in the correct format. If your Fotogra Book does not arrive in excellent condition due to shipping mishandling or does not withstand “normal wear and tear”, please let us know.